One of the great challenges for businesses such as gym owners is keeping their customers engaged on a regular basis. For Crossfit South Yarra, a Shareable App became the perfect vehicle for an ongoing customer loyalty programme. Another great example of a win-win solution for the business and for their customers, the Crossfit SY Shareable App is dynamically updated to include the latest workouts and results, tips, contact info and news from their various social media channels. 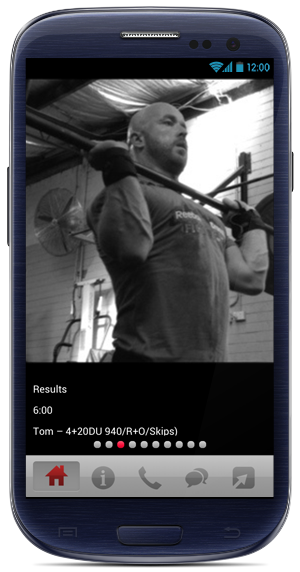 The app was designed to service Crossfit SY’s exclusive member audience, and once deployed, over 75% of its recipients are using the app on a regular basis. Many of them are checking in every single day, which is a great result for the gym and its members – something that would not be likely to happen using any other medium. Crossfit South Yarra members check in every day to see their workout of the day (WOD) and their results, no matter where they are. Members have even been accessing the programme from foreign countries whilst away on work or holiday. You can create a Shareable App for your fitness centre simply and easily, right here in our app designer, for a lot less than you think, whatever industry you’re in. Sign up for your free account, login, call 13 SHARE (or +61 13 7427 outside Australia) or email support@shareableapps.com for more information.